To help supplement our mission of spreading knowledge, hope, and support to caregivers, ADRC’s Resource Library boasts a range of free informational PDFs available for download. Filled with helpful caregiver tips, advice, and newsletters, the Resource Library is a switchblade of quick information for every caregiver. 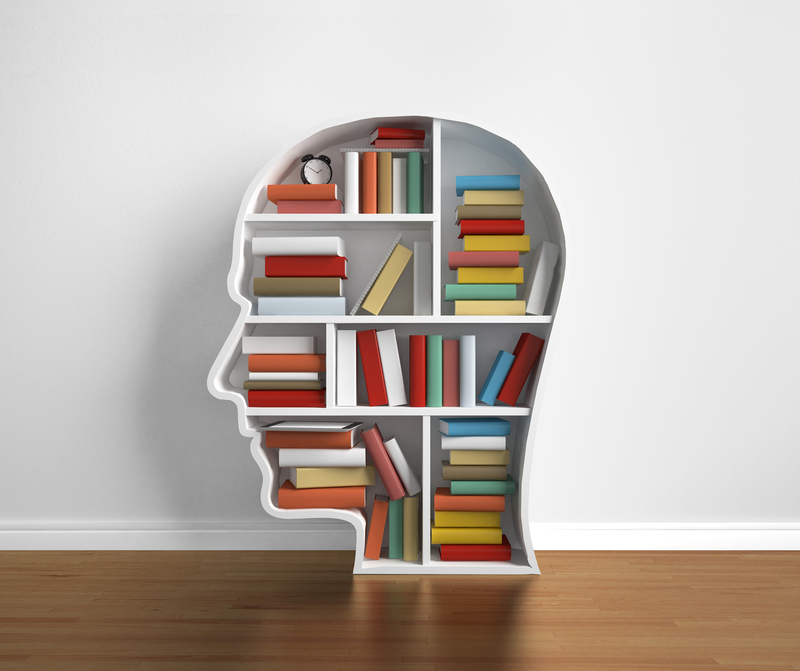 The Alzheimer’s & Dementia Resource Center also has an extensive Caregiver Library at our main office for caregivers individuals to come by and rent out one of our many books covering caregiving advice, healthy aging, Alzheimer’s disease and various other types of dementia. Our office is located at 1506 Lake Highland Dr, Orlando, FL 32803. For more detailed and personalized care coaching regarding information on local referrals, programs, and resources, please contact family services at (407) 843-1910 or at our toll-free number (800) 330-1910. The Alzheimer’s & Dementia Resource Center is based out of Orlando, FL and is heavily focused on Florida’s caregiver community. If you are not from Central Florida and need detailed and personalized care coaching regarding local information and referrals regarding your specific area, search here for your state’s Elder Services Helpline. ADRC has also partnered with Antidote in helping them take on the immense task of bringing order to chaos by standardizing clinical trial eligibility criteria and connecting patients who are seeking out all of their options. Antidote helps you discover your clinical research opportunities and works to connect you to the right medical teams needed in make those options a reality. By taking part in a clinical trial, you can help make future clinical trials better for both you and millions of other patients. Your experience helps researchers learn what they can do better in order to successfully develop and improve treatments, medications, and ultimately come to a cure for your condition. Just type in your condition, answer a few questions about yourself, and if there is something for you, the Antidote Search Engine will help you find it. Can your loved one be left alone? 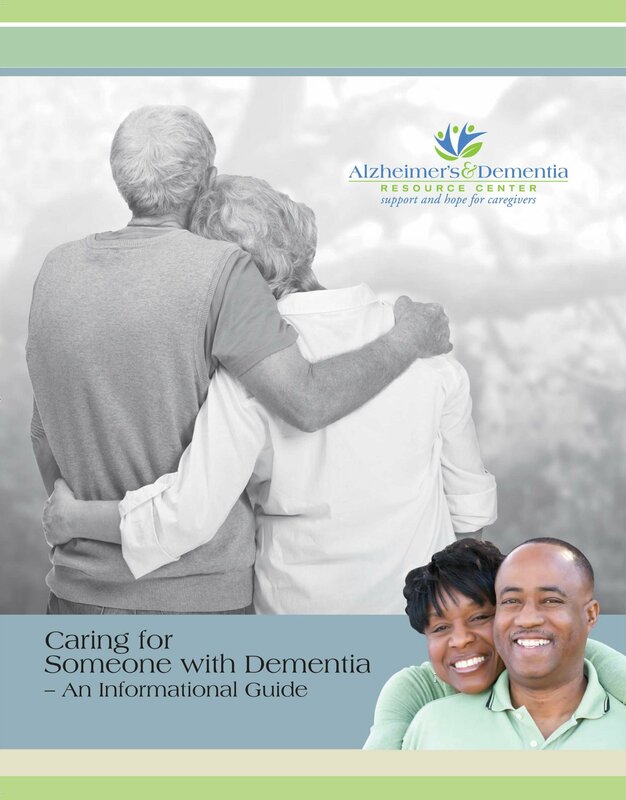 The Alzheimer’s & Dementia Resource Center features Caring for Someone with Dementia – An Informational Guide, our definitive book and caregiving guide detailing all the information a caregiver needs to know to tackle dementia head-on. Purchase our caregiver guide for only $10 on Amazon to add to your own personal resource library. It contains information about the disease and issues such as communication, handling difficult behaviors, driving challenges, in-home and facility care options and much more. 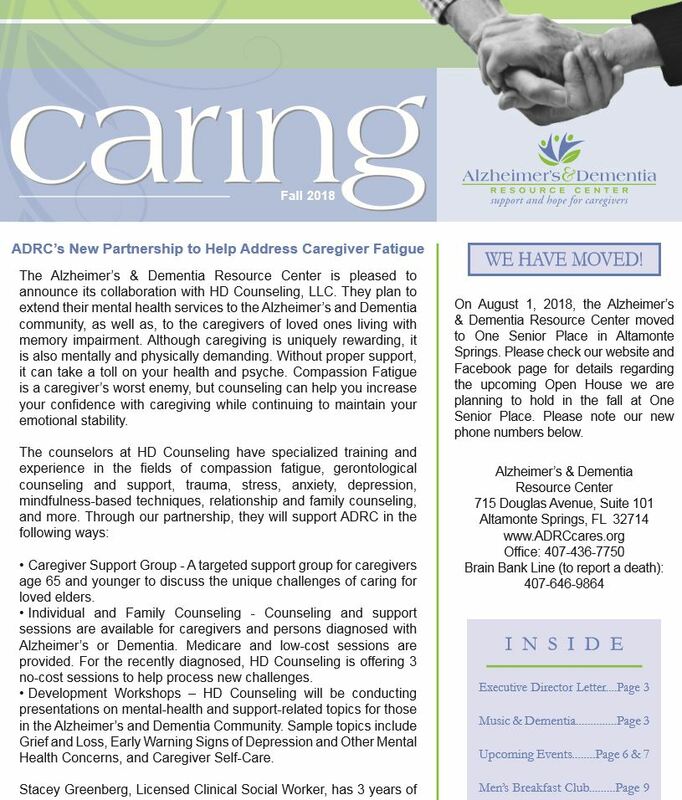 Caring for Someone with Dementia – An Informational Guide is published by the Alzheimer’s & Dementia Resource Center, who have served the Central Florida caregiver community for over 30 years. The Caring newsletter has been ADRC’s signature publication for over a decade, regularly discussing helpful caregiving topics and dementia-related articles. Distributed bi-annually and reaching over 20,000 caregivers across Central Florida, this valuable newsletter covers a variety of helpful subjects like the importance of a healthy lifestyle, advocating for the elderly, community news and current events. Please feel free dive into our Newsletter Archive and read all of the PDF newsletters available online for you to enjoy! Subscribe to our newsletter mailing list and stay up to date by scrolling down to our Newsletter Signup. Happy reading! 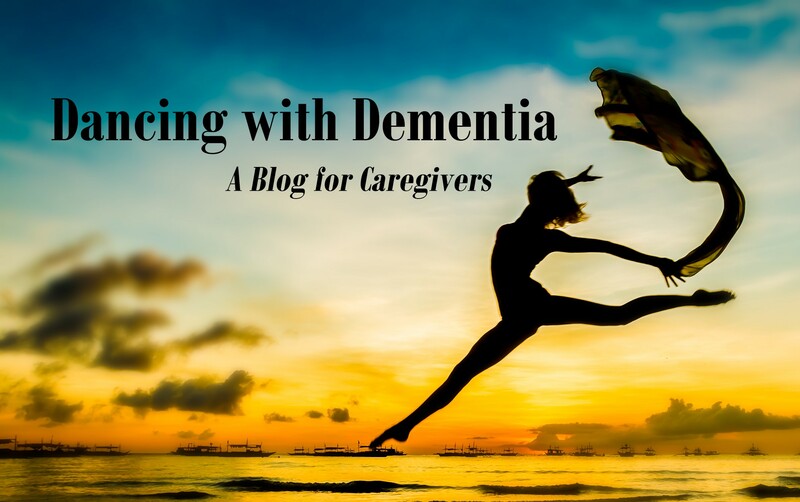 Also featured in our Resource Library is Dancing with Dementia, a blog that focuses on covering a wide range of highlighted topics intended to provide caregivers information that will improve their quality of care and understanding of the complexities of Alzheimer’s disease and other related dementia. From providing a basic understanding for the caregiver to mindful food for thought, we at ADRC hope you find the blog topics interesting and the information contained in them useful.